In just a few short years, Marc Jacobs‘ portfolio of ultra feminine scents have become fragrance classics. Perhaps the most beloved is Daisy, a bright and breezy floral that is exceptionally easy to wear. Given its popularity, it’s not all that surprising that it’s has had its fair share of flankers. The biggest change came with the launch of Daisy Eau So Fresh, a lighter fragrance that is Daisy in spirit, but has a personality all of its own. It is, if possible, even more girlish and floral! Marc Jacobs’ other pillar fragrance, Lola, also had a similar reworking in the form of Oh, Lola!, a youthful and lighthearted version of the vanilla floral. The Daisy Sunshine Edition is pure summer. The top notes of sweet red currant, exotic guava and juicy mandarin shimmer with vibrancy, more akin to an Escada summer fragrance than the Daisy Eau de Toilette. As the scent mellows into the heart notes, it starts to resemble the original a little more closely. Fresh lily of the valley and lychee structure the louder fruit, and these in turn are anchored with a skin-like base of woods and musks. 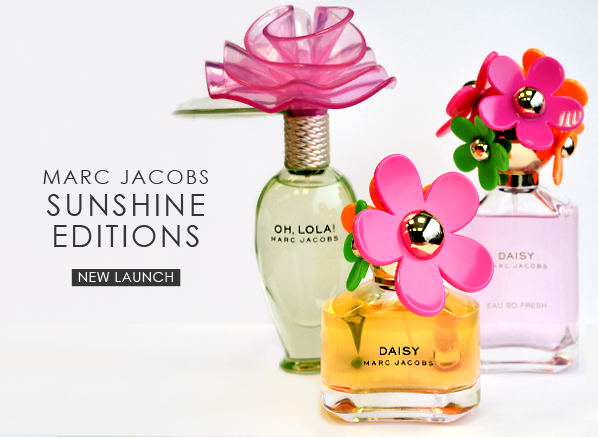 Daisy Sunshine Edition is my personal favourite of the three new fragrances. It’s such an optimistic and playful fragrance, and a welcome change from some of the heavier florals I’ve been wearing of late. I get about 4-6 hours wear from the scent, and it has excellent sillage. A couple of sprays made the whole office ask which lovely scent was being trialled! With its lemonade pink juice and riot of neon flowers, the Daisy Eau So Fresh Sunshine Edition is a gorgeous summer confection. Like Daisy Sunshine, it takes the original scent and boosts it with warm and bright notes, this time strawberry, apple blossom and refreshing pink grapefruit. It’s not quite as fruity as Daisy Sunshine, relying instead upon its airy, floral heart notes to create a sun-kissed feel. A dry down of violet, moss and wood round off the feminine fragrance. The longevity of this scent is slightly shorter, around 3-5 hours on my skin, though the bottle is of a larger size so you can spray this one liberally. This is a great fragrance for the spring to summer transition, all languid fruits and blushing flowers with a subtle fruitiness that is more universally appealing. Smooth, floral and sensuous, this sheer interpretation of Oh, Lola! is so mouthwatering. The balancing of raspberries and fraise des bois with vanilla is like a bowl of strawberries and cream. Added notes of romantic peony and magnolia comprise a complementary, lighthearted feel in the heart, and woods and creamy tonka bean in the base to reinforce the creaminess of vanilla. Though the Daisy Sunshine Edition pipped this scent to the post in terms of being my favourite, I believe that this is probably the fragrance that I would reach for the most of the three. There’s something compelling about the creamy, fruity combination of notes, and it’s quite unlike anything else I own. It’s a shame it’s only around for a short time! As Oh, Lola! Sunsheer Edition is an Eau de Parfum, it has an impressive wear time of around 6-8 hours, though sillage is not as great as Daisy Sunshine. This entry was posted on Thursday, February 28th, 2013 at 10:51 am and is filed under Fragrance, New products, Tried & Tested. You can follow any responses to this entry through the RSS 2.0 feed. You can skip to the end and leave a response. Pinging is currently not allowed.